On Sunday 23 September, #fmr and I ran the 2XU Compression Run half marathon. This is my second 21 km race for this year and it was meant to be the lead up to our 42 km next year. I say “meant to” because it doesn’t look like we will be running a full marathon next year any more. 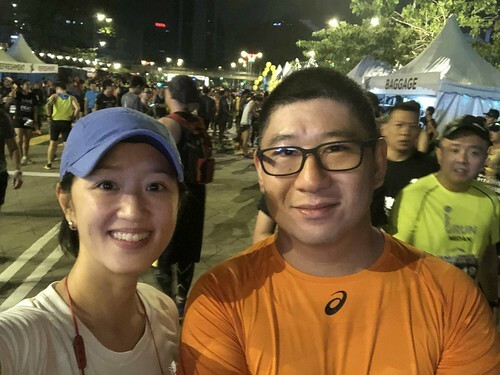 With the frequent foot pain #fmr has been suffering as a direct result of his running, pushing that kind of distance just didn’t seem sensible. Yes. I know. I could run it myself as I did once before more than 10 years ago, but I also remember being utterly destroyed after. Something for future Shen to think about. 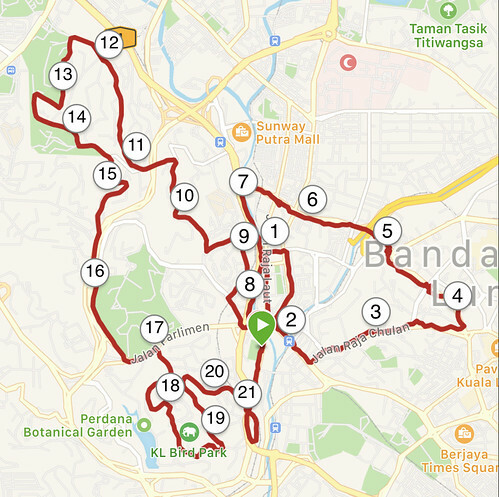 We started at Dataran Merdeka, ran around the city for a bit, through some inclines in Bukit Tunku, around Lake Garden and the Bird Park, and then back to our starting point. It was more challenging than the last 21 km we ran purely because the inclines were nastier. I didn’t improve my time, but my heart rate profile certainly looked a lot better. I spent less time in the Zone 5 (red) and had a nice spread across Zones 1 to 4. If I had pushed harder, I think I could have run a faster race. Maybe if #fmr’s voice wasn’t ringing at the back of my head, “Please don’t kill yourself,” I might have gone for broke. The most significant improvement I noticed was how I felt running up those hills. I remember a time when hill running made my heart feel like it was trying to punch a hole out of my chest cavity and if I didn’t stop to walk, I would probably throw up. Running the inclined sections of the 2XU Compression run was surprisingly “doable”. I could make it up without having to slow to a walk – not that I was blasting up the hills with any speed or anything, but it was still at a jogging pace. Considering that I have not clocked in much mileage on foot, I must credit the improved cardiovascular endurance to all my flycycle and boxing training. Those workouts have really given my ticker a run for my money. If I’ve been complaining about the lack of obvious improvement in physical fitness, I guess this would be a pretty good indication that I have gotten fitter. It is rather an abstract feeling and there are no definitive numbers, but I’ll take it. Long distance running is always hard the knees – especially mine – so I expected them to feel pretty broken at the end of the race. The worst part was the descents. Pounding the road is bad enough without the extra force of gravity working against you. The post-run recovery for my knees was surprisingly not too bad. Interestingly enough, the real pain came from my right foot. I couldn’t walk without pain for the next two days. #fmr advised me to strap it with an ankle brace and it seemed to do the trick. My foot has been pain-free until my first run in the gym this morning. It was only a 30 minute run, but I noticed the pain setting in partway through. As a runner, I have a tendency to run on the balls of my feet. I find that this style of running helps to reduce the discomfort in my knees. When my right foot started hurting, I switched to the heel-strike run pattern and my foot was okay again. Unfortunately, the left knee didn’t like the heel-strike running style and started to complain. In the end, I had to complete the run with mix – landing on the ball of my left foot and the heel of my right. It makes for a pretty funny running gait and I don’t know if it’s bad to run like this. After the chaffing problems I had during the IJM run, I changed bras and ran with a liberal application of chamois cream under my heart strap. It worked perfectly. The problem this time was chaffing from my underwear. Since I’ve never had this problem before, I figure it must be this particular underwear. I had my standard breakfast – coffee, banana, and nutella with avocado sandwich. I brought three SIS gels but only took two – one at the 8 km mark and the other around about the 16km mark. I also took the 100Plus drinks at the water stations whenever it was available. The plan was to sleep early, but I messed around a bit and didn’t get to bed as early as I was supposed to. I clocked in about 5 hours of sleep or thereabouts, which probably wasn’t optimal. I certainly felt it when I arrived at the starting point. Normally, I feel pretty jazzed on race day, but that day, I felt “off”. I started slower than usual but it may have been a good thing because it gave my body more time to warm up.